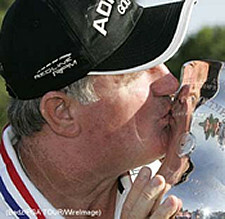 Alan Doyle wins the 2005 U.S. Senior Open. From back in the days of the late '1970's televised golf has used unemployed caddies the week of golf tournaments to get the yardage for the on air and walking announcers who bring each week's tournament into the living rooms of today's golf fans. Reason is the caddies know the players and caddies and know how to move about out there without getting in anyone's way. This past week it worked out in my schedule to be in Dayton, Ohio to work for Lou Serafin of NBC at this year's U.S. Senior Open golf championship. It's a pretty simple job really. You are usually assigned a group to follow at the beginning of each days employ and your job is to go out on each hole following the groups tee shots and get the yardage to the front of the green and then add in the days pin sheet to compute the final tally to the hole for each player in the group. If and when they need your info they call on you via your portable headset and you give them the brief and relevant info. It's a light 'grunts' job which gets you inside the ropes to a 'birds eye' view of what's going on and a few sheckles for 'down the road' so to speak. After my first two days spotting it was my observation that the golf course was not playing very long. The top players on the Champions tour all hit it pretty far anyway and there were an awful lot of short irons into greens with the par fives being reached in two shots as well by most of them. Dry and firm fairways also played a part for what looked to be a fairly low scoring affair and atypical for a U.S. Open format. Stadler shot 64 on Thursday, Watson shot 65 on Friday, Roberts a 66 -67 for the first two rounds, and Raymond Floyd (a super senior) took advantage of the short conditions and played wonderfully all week. I imagine as well that the 'Push Hook', straight hitting driving style of Alan Doyle as coined by Johnny Miller got it's share of 'roll out' all week long as well. On Saturday I had the pairing of Tom Watson and Loren Roberts -both of whom were tied for the lead along with Craig Stadler after 36 holes at NCR. Stadler played just in front of my group in Saturday's third round and since my job was to be ahead a half hole to get yardages I saw a lot of Craigs round. Stadler birdied the last three holes Saturday to finish tied for the 54 hole lead with Loren Roberts. However, I could see that something was amiss in 'Stads' game. Normally a fader (left to right) of the golf ball Craig was occasionally pulling his drives and irons or pushing the shot to the right. He was tied for the lead because he was making enough birdies to counter his ball striking mistakes and bogies. On Sunday my assignment was to do the yardage for the final round pairing of Craig Stadler and Loren Roberts and for Roger Maltbie on the ground. On the final day Stadler was like a 'Yo-Yo' again. He bogeyed the first hole and birdied #'s 3, 5, and 6, but buried a tee shot in the right hand bunker at the 4th and 9th holes resulting in a bogey and double bogey respectively that let everyone back in contention on the back nine on Sunday. Thereafter, Craig missed the first four fairways on the back nine and fell out of contention with a bogey from the rough on the 14th hole. On the 15th tee he asked his caddy Jeff Dolph to "Give me a new ball that doesn't have bogey written on it". Jeff pulled a new ball out and handed it to Craig but it was already too late. Playing in front of me from the front of the 14th green D.A. Weibring (who had been in it quietly all week long) was making a par to stay -11 with a one shot lead over Doyle who had posted a remarkable 63 and was in the clubhouse at -10 for the tournament. D.A. looked to be hitting a lot of fairways and greens and had the advantage of playing from behind with very little hype about it. However, his tee shot on 17 just crept into the left rough (it's usually worse when you just get it in the deep stuff nearest the first cut), and could only extricate his golf ball into more rough fronting the bunker at the 17th green. A resulting bogey there on 17 then required that Weibring par the par four finishing hole to get himself into a playoff with Doyle. I could tell D.A. selected a 7 iron by the squareness of the toe of the club head -(vs. an 8 iron which looks rounder when you set it down). I knew the front of the green was only about 140 yards. D.A. had a clear shot from a clean lie to play into the fat of the green and try to get himself two putts to go to on to a playoff with Doyle. I thought about the yardage #'s in my head for a bit and thought this should only be an 8 iron and with player adrenaline going in that situation. 8 Iron should have been plenty to get the job done as you can't miss it long. Sure enough the 7 iron carried about 10 steps onto the green in the air and then released over into the rough behind. Just what you don't want. A difficult chip and no doubt a 'knee knocker' at best to tie for the U.S. Senior Open! The rest is now history. Doyle wins with Weibring bogeying the last two holes. Do I blame Russ 'Pinecone' Craver for not giving his man the 8 iron? No way. It's still a tough call. If he tells D.A. to hit 8 iron and pull him off his selection and should he catch it a little heavy or something -then he's a dog. Sometimes the caddy will get more play on the selection in the situation, sometimes not. But it is what you get paid for. To be right when it matters. It's unfortunate however for Russ and D.A. alike that their outcome wasn't better. And fortunate for a guy who's always made his own luck. Allen Doyle. I caddied for him for three tournaments in the late 90's and occasionally see him in my travels on the golf tours. Different guys have worked for him for stretches over the years and he's not easy to caddy for. Why? Because he's more demanding of himself than most players would ever be. And as a result that same burden falls on the guy who's on his bag. A reliable source once told me that Mr. Doyle was once seen banging his head against an oak tree behind the 18th green berating himself over some bad play he'd made in the round during a big amateur event. And I mean almost drawing blood! Alan Doyle was mismatched those two years he played on the regular tour on those long golf courses. But two things I observed really caught my attention about his game. He hit it very straight and was able to repeat it time and again and that he had an uncanny ability to get the ball in the hole no matter where it was! I guess you could say that's what all the good ones do. After Saturday's round Doyle was two under par. As I was leaving for the day I crossed over on the putting green to shortcut my way back to my car well after the finish of Saturdays play. There was Alan Doyle with his caddy still practice putting Saturday evening with almost everyone else gone. I shook his hand and In conversation I got caught up with him a little and told him 'Nice Playing' this week. He said, 'Not really today', and I gave him the canned, 'Well, that's why they give you four rounds right?' And he replied 'That's right' back to me. I wished him well and moved on to my car. I never thought he had a snowballs chance in hell to win the golf tournament. And the thought never even crossed my mind. And like a lot of other 'know-it-alls' like myself, I thought this 57 year old 'dog' had had his day. But then again, now that I think about it, his entire pro career has proven otherwise. Yes, I got to shake his hand again after Roberts missed his birdie attempt to tie on 18 on the same putting green as the night before. But I've got to tell you it had -just-a-little-more meaning than the night before. I'm not fooled by that hunched over repeating hockey swing or push stroke putting style or seemingly off-the-cuff 'I fooled 'em' again' demeanor. Inside is one very tough and vicious competitor. More importantly though -Alan Doyle once gave his entire Charles Schwab Player of the Year prize award of $1,000,000.00 to charity -to the 9/11 fund. That's a ton of money coming from someone who never really had any dough until recently in his life compared to today's professional athletes. All those years Alan Doyle and his wife raised a family and two girls by running a hands on driving range in La Grange, Georgia. In the end surprisingly, Mr. Doyle got all of our attention again this week. "I always thought I was a USGA Champion", said Doyle, "And now I have the trophy to prove it". Work hard and it pays off. Do the right thing and it will work out for you. There's a pot of gold at the end of your rainbow. The American Dream does exist -or so we all hope. Maybe and more importantly his winning is a way of bringing to us perspective once again about what our priorities should be about and what really matters in this lifetime. A timely win by a guy who brought us that perspective by his unselfish giving in the past only to wear the crown of his generations National Open on the last day of July 2005 in such troubled times for America as these remain to be.